It was muy magnificent! I was so proud of myself! I also made the cranberry sauce (from scratch) and the roasted sweet potatoes. Damon cooked the turkey (I'm not ready to tackle the big bird yet), stuffing and yeast rolls (also from scratch). I think we're going to buy all our turkeys from Whole Foods from now on. Whatever they feed organic turkeys makes a difference in the meat. The taste is phenomenal. Marlie certainly enjoyed it! She and I split a bottle of sparkling cider while everyone else had wine. She looked so grown-up sitting at the big table.I forgot to take pictures at dinner, but that's what happens when you're in the moment. Marlie wanted to put the angel on top first. Then she proceeds to break ornaments and pull off the lights. We put the decorating on hold. An update on chocolate chip: my last OB visit was good. I opted out of the anatomy scan, so we are still in the dark about whether CC is a boy or girl. I am going to try to keep it that way. I really do want to be surprised. Damon surprised me with a pregnancy pillow this week. It's like sleeping on a cloud, but I think he is regretting his gift purchase because the thing is HUGE and takes up half our bed. I know he hates sleeping next to it, but he doesn't say it. so. sweet. I hoping this year we finally can have ornaments on the bottom half of the tree without Abby trying to play with them and break them. Marlie looks so cute :). No kidding, I had a dream last night that you were 100% having a girl. So much so that I was surprised to hear that you want to be surprised because I figured you must have said somewhere something about girls. Weird! But who knows, maybe I'm right! I'm still thinking boy - I figure that I have about at 50% chance of being right! I LOVED my pregnancy pillow. I don't know what I would have done without the last two months. My only regret was that they didn't exist when I was pregnant with my older children (at least that I knew of). I think I'm gonna try to make the cranberry sauce from stratch next year. *fingers crossed* And thanks for sharing the wealth about the turkey. I have to try one from whole foods. So glad you guys had a lovely Thanksgiving, sipping on cider and whatnot. Your note about the pillow made me laugh, but yes, it was sweet of him! 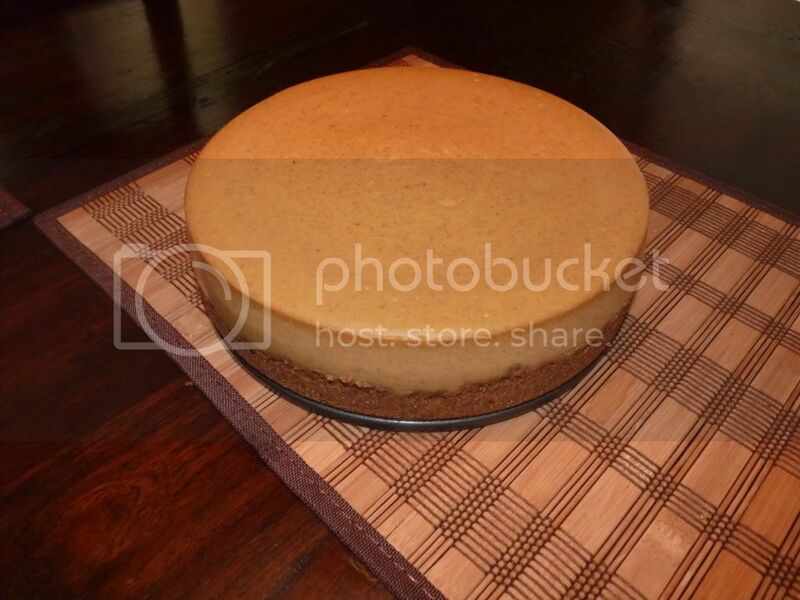 Oh wow pumpkin cheesecake! Now that sounds delish. You and I are opposites: I'm intimidated by cheesecake yet I can tackle the turkey. LOL! Totally agree about the Whole Foods turkey. I knew you'd love it =) So funny about Marlie and her tree. Love her enthusiasm and can't wait to see the finished product . . . and SO sweet of your hubby with the pregnancy pillow. I'll definitely get one for #2. I'm glad that you had a great Thanksgiving and that you are all (including chocolate chip) are doing well. Love that picture of Marlie and the tree. Now you have me thinking about a whole foods turkey too. And enjoy that pregnancy pillow. I hear that they do wonders for a good night's sleep. 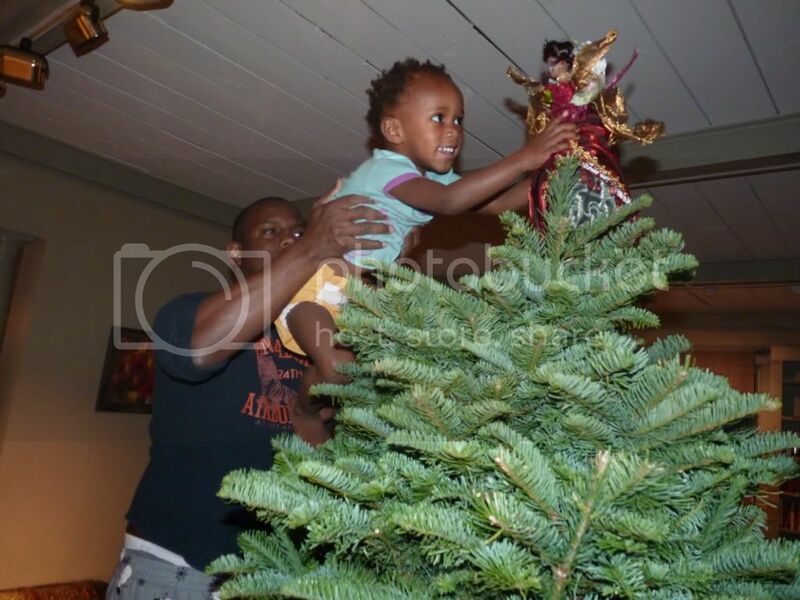 I love this picture of Marlie putting up the angel on the tree!! I'm very impressed with your mad skills in the kitchen! And how very thoughtful of Damon. I should have let my cheapskate self buy a pregnancy pillow. I was always uncomfortable!